We have chosen to work with 96Boards to make our latest edge AI technology available to developers of artificial intelligence (AI) solutions worldwide in a standard form factor supported by an active community producing innovative real-world solutions. Linaro Ltd, the open source collaborative engineering organization developing software for the Arm® ecosystem, announced today that leading ASIC-based cryptocurrency mining hardware provider Bitmain has joined the 96Boards initiative as a Steering Committee member and has announced an initial 96Boards product, the Sophon BM1880 Edge Development Board (EDB). Bitmain launched the BM1880 edge AI chip in October. This is Bitmain’s first AI chip providing high performance, low power Deep Learning computing power for edge devices. The Bitmain BM1880 enables cutting-edge deep learning techniques, like facial recognition, in real-time on small devices without needing an Internet connection. To help develop broad range of AI applications, Bitmain also provides a comprehensive toolchain, including compiler and quantization tools, for developers. The Sophon BM1880 EDB is the first product available to developers who wish to develop with the new chip. Bitmain began working with 96Boards after identifying the program as an effective vehicle to give developers access to this new technology. 96Boards is Linaro’s initiative to build a single worldwide software and hardware community across low-cost development boards using the latest Arm technology. A large range of products compliant with the 96Boards specifications is available worldwide and this is supplemented with additional hardware functionality provided through standardized mezzanine boards. The 96Boards Steering Committee provides a neutral forum in which companies can cooperate closely to offer semiconductor products in a standard form factor for rapid product development, testing and prototyping. The new Bitmain Sophon BM1880 EDB is the first ASIC-based solution to join the 96Boards.ai line up, which already includes boards bringing the latest CPU, GPU, FPGA, DSP and NPU silicon to developers in a standard form factor. 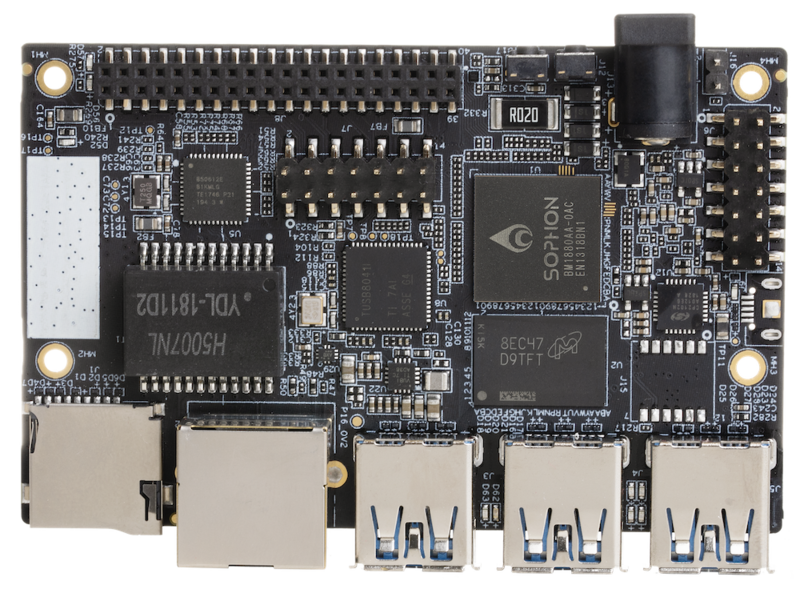 The EDB conforms to the 96Boards CE Edition specification, and key features include dual Arm Cortex-A53 cores, a Bitmain Sophon edge TPU unit offering 1 TOP performance on 8-bit integer operations, USB 3.0 and gigabit Ethernet. Further information about the board is available on the 96Boards.ai website. Founded in 2013, Bitmain transforms computing by building industry-defining technology in cryptocurrency, blockchain, and artificial intelligence (AI). The company also operates the world’s largest and second largest Bitcoin mining pools in terms of computing power, BTC.com and Antpool. A leader in the still-nascent, high-growth blockchain technology ecosystem, Bitmain supports a wide array of blockchain platforms and startups, and actively participates in industry and community development. Bitmain has also been active in the AI industry since late 2015, launching its first AI deep learning chip in 2017 under the Sophon brand, followed by a second-generation AI chip with five times the performance. These AI chip products extend capabilities in applications such as machine vision, data centers, supercomputing and robotics. Bitmain is headquartered in Beijing with offices throughout China, including Hong Kong, and with global offices worldwide. Visit https://www.bitmain.com for further information. Linaro is leading collaboration on open source development in the Arm ecosystem. The company has over 300 engineers working on consolidating and optimizing open source software for the Arm architecture, including developer tools, the Linux kernel, Arm power management, and other software infrastructure. Linaro is distribution neutral: it wants to provide the best software foundations to everyone by working upstream, and to reduce non-differentiating and costly low level fragmentation. The effectiveness of the Linaro approach has been demonstrated by Linaro’s growing membership, and by Linaro consistently being listed as one of the top five company contributors, worldwide, to Linux kernels since 3.10. To ensure commercial quality software, Linaro’s work includes comprehensive test and validation on member hardware platforms. The full scope of Linaro engineering work is open to all online. To find out more, please visit http://www.linaro.org and http://www.96Boards.org.